I’ve been ranting the extremely hot weather lately and literally I’ve been having headaches because of the temperature. This afternoon, I can’t anymore stand the hot temperature so I decided to make some fruit shake. I don’t have the fancy fruits that one would normally use for fruit shake. All I got were a can of blueberry pie filling and some chunks of yam bean / jikama or what we call here in the Philippines singkamas. Yam bean is a watery type of bulb that we usually dip in salt or with bagoong alamang. Its white and crunchy and had a subtle hint of sweetness. To be honest, its somewhat refreshing. Did you also know that yam bean or singkamas is used as a whitening agent? In the cosmetic industry we add it’s extract in our lotions and creams for whitening effect. Going back. I realized that I don’t have available fresh fruits to make some fruit shakes. Just then I remembered I had a can of blueberry pie filling and some chunks of yam bean that I’ve been nibbling from time to time whenever hunger strikes me. I found some condensed milk in the fridge and luckily we had some mini ice cubes, though its few, is a big help to ease this heat. 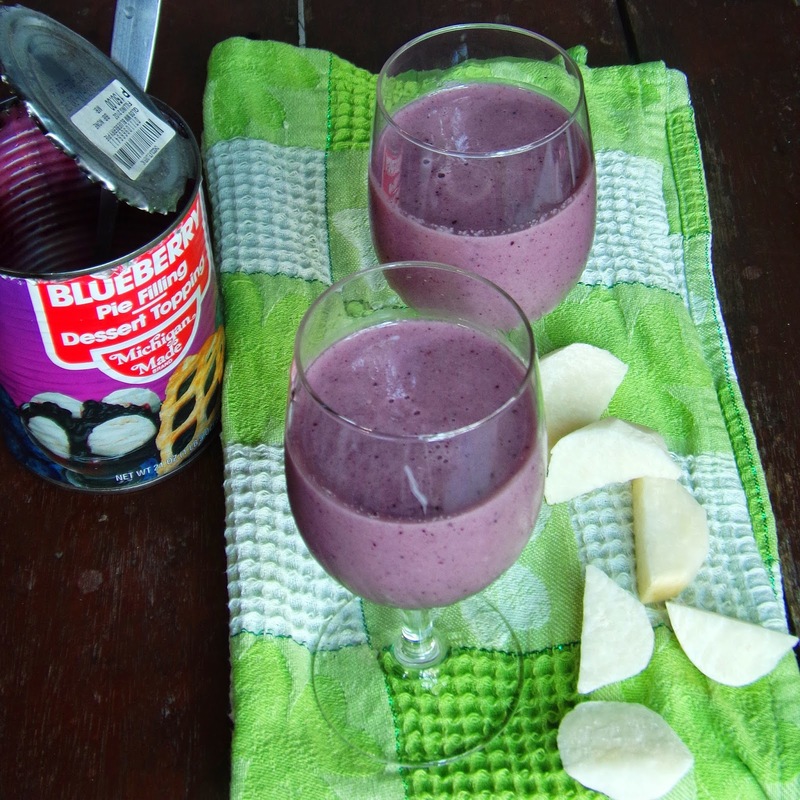 So i decided to combine the two and come up with this Blueberry and Jikama Shake recipe. This is not your usual shake. This blueberry and kikama shake recipe has a subtle tartness coming from the blueberry and a hint of aftertaste of the yam bean. Its does not have the usual fruity taste of your fruit shake but the taste is interesting. In a blender, add the yam bean. Set you blender to Frappe or Liquify mode. Add blueberry and ice and operate on the same mode. Lastly, a the milk. Adjust according to taste.